Guided by RoadNet Anywhere, Kowalski Sausage Company drivers deliver local delicacies across the upper Midwest. Since 1920, Kowalski Sausage Company has kept Michigan and surrounding states well fed by offering 55 types of locally made meat products, side dishes, and a new line of salad dressings. The company has been growing its menu of products by acquiring new companies, but its routing and delivery system couldn't cut the mustard. The fourth-generation family-owned company operates a fleet of 10 trucks and drivers that directly service about 500 grocery chain stores, independent grocers, distributors, and warehouse clubs, with delivery windows that range from 30 minutes to six hours. Kowalski's raw and unprepared foods require refrigeration during transport, so on-time service from its three production locations is vital. 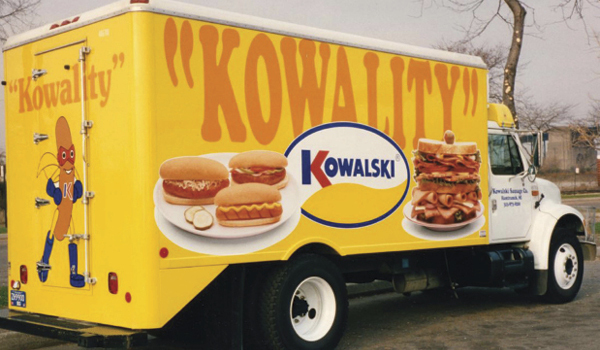 For years, Kowalski Sausage relied on route sales people and drivers to make daily sales and deliveries at the stores. Then, in 2010, the company changed its business model to separate sales and fulfillment staff, add a sales force and call center, and allow drivers to focus on long-standing delivery routes. The company typically delivers orders within two days, and maintains regular delivery schedules that receivers and drivers have come to live by. For instance, Tuesday is Kroger day.